#4 Oliver Ames, 2 vs. #12 Walpole, 1 – Final (2OT) – Click here for a recap and photo gallery of this game. #5 King Philip, 2 @ #1 Natick, 1 – Final – King Philip took the lead in the 11th minute when sophomore Chloe Layne blasted a song off the crossbar and in, putting the Warriors up 1-0 in the 11th minute. Natick knotted the game 1-1 in the 60th minute, but six minutes Layne found her second goal, converting a breakaway after being set up by Hanna Balunos. Emma Durant had a strong game in net for the Warriors. 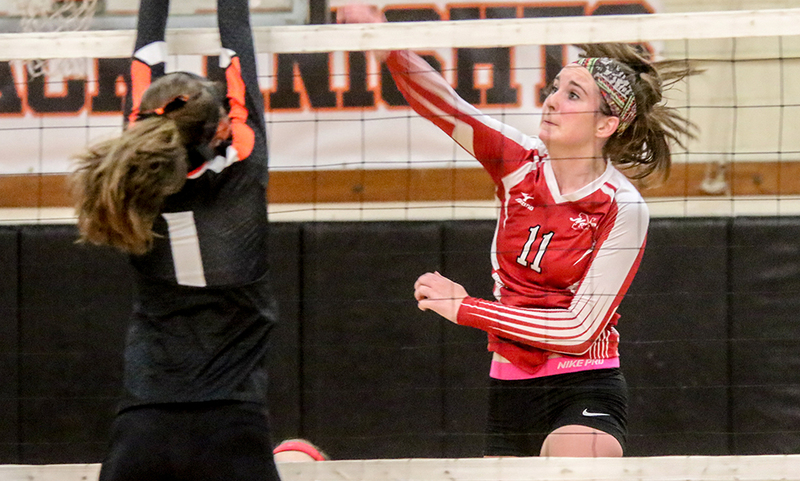 #2 King Philip, 3 vs. #6 North Quincy, 2 – Final – King Philip outlasted sixth-seeded North Quincy, rallying from a 2-1 deficit to pick up the win and advance to the sectional final (25-18, 21-25, 15-25, 25-20, 15-10). Sydney Phillips paced the offense with 17 kills along with eight service points (one ace) and five digs while Kat Kmetz had eight service points (two aces), four kills, three blocks and a pair of digs. Rachael Veilleux chipped in with nine service points and four kills and Michaela Palumbo had 13 service points (two aces) and three kills. 1st Quarter: (N) Mansfield penalty, safety. 3rd Quarter: (N) Amir Wells 5-yard rush, XP good. 4th Quarter: (N) William Lederman 54-yard rush, XP good. 2nd Quarter: (B) Brockton 4-yard rush, XP good. 3rd Quarter: (T) Noah Leonard 1-yard rush, 2pt rush failed. 4th Quarter: (T) Everett Fereira 26-yard field goal.